Click here to Subscribe to the Youtube Channel. 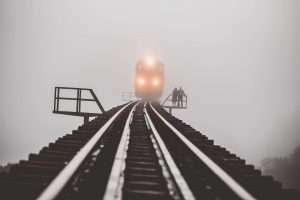 As you know, essay writing and paragraph structure can be amazingly straightforward and easy experience or ….an absolute train crash! A few years ago, I remember correcting IELTS essays, and seeing some “interesting” paragraphing skills. -One single idea spread over three paragraphs! -And my favourite… single paragraph essays! Fortunately this problem can be cured pretty quickly if you are getting feedback. ‘Paragraphing’ is the organization of a number of sentences into a block of sentences. The paragraphs are set apart from each other by indentation. On this slide of this presentation, for exampleyou will see that there are three paragraphs. Each begins with an indentation. – Skilful paragraphing means grouping words together so that they seem to belong naturally together. – We don’t want a paragraph break to come between two sentences, one of which follows from or illustrates the other. – Conversely, we don’t want sentences which seem to have nothing to do with each other to be included in the same paragraph. – Let’s illustrate this by looking at a sample block of text, and seeing how we might best paragraph it. In recent years, many scientists have become concerned about the problem of ‘global warming’. This occurs when the burning of fossil fuels emits certain gases which have a tendency to destroy the ozone layer in the earth’s atmosphere. Ozone protects the earth from the sun’s rays. Without an ozone layer, the earth would quickly heat up and its ice caps, for example, would melt. The melting of the ice caps would cause sea levels around the world to rise, leading to floods. Some low-lying countries would probably be completely inundated and become uninhabitable. In order to avert such disasters, it has become necessary to prevent the earth’s average temperature from rising so quickly. This can be done by reducing our dependence on fossil fuels and by turning instead to renewable forms of energy such as wave, wind, and solar power. It might also involve using less energy altogether, in absolute terms. In practice, of course, you will divide your work into paragraphs as you are writing, rather than first writing a large block of text, as we have done here, and then dividing it into paragraphs. But the method adopted here is a useful way of illustrating some ‘do’s’ and ‘don’t’s of paragraphing. One approach (not one I recommend!) would be to make every single sentence a paragraph. In recent years, many scientists have become concerned about the problem of ‘global warming’. This occurs when the burning of fossil fuels emits certain gases which have a tendency to destroy the ozone layer in the earth’s atmosphere. Ozone protects the earth from the sun’s rays. Without an ozone layer, the earth would quickly heat up and its ice caps, for example, would melt. As you can see, I didn’t have space to paragraph the whole block of text in this way—but you can see the idea. To have a large block of text with no breaks can feel breathless and rushed. But if we turn each sentence into a paragraph, the result is odd. It seems over-emphatic and mannered, as if the writer were pausing for effect after every sentence. This occurs when the burning of fossil fuels emits certain gases which have a tendency to destroy the ozone layer in the earth’s atmosphere. Ozone protects the earth from the sun’s rays. Without an ozone layer, the earth would quickly heat up and its ice caps, for example, would melt. The melting of the ice caps would cause sea levels around the world to rise, leading to floods. Some low-lying countries would probably be completely inundated and become uninhabitable. Here, the balance between text and paragraph breaks looks better, at least superficially. Instead of having either two few or too many breaks, we have a reasonably balanced ratio of text to breaks. The difficulty is with the placement of these breaks. The break should not come in the middle of a point which you are making. The second sentence, though, is exploring the consequences of the first. So the two sentences naturally belong together in the same paragraph. Another example of this can be found earlier in this way of arranging the paragraphs. The topic of ozone is thus artificially broken up into two separate paragraphs. The effect of this is that the paragraph break impedes the reader from following the flow of the argument, instead of assisting the reader to follow it. In recent years, many scientists have become concerned about the problem of ‘global warming’. This occurs when the burning of fossil fuels emits certain gases which have a tendency to destroy the ozone layer in the earth’s atmosphere. Ozone protects the earth from the sun’s rays. Without an ozone layer, the earth would quickly heat up and its ice caps, for example, would melt. The melting of the ice caps would cause sea levels around the world to rise, leading to floods. Some low-lying countries would probably be completely inundated and become uninhabitable. In order to avert such disasters, it has become necessary to prevent the earth’s average temperature from rising so quickly. This can be done by reducing our dependence on fossil fuels and by turning instead to renewable forms of energy such as wave, wind, and solar power. It might also involve using less energy altogether, in absolute terms. This division into three paragraphs is a much better one. It provides you with paragraphs of a good size, neither too small (for example, a single sentence) nor too large (paragraphs as long as or longer than a page). It also groups each stage of the argument in a separate paragraph. 1. Paragraphs should be neither too long nor too short. They should be longer than a single sentence, but not longer than a page. 2. Paragraphs should be unified. All the material within a paragraph should concern a single topic. 3. Paragraph breaks should not split apart sentences which are logically or illustratively connected to each other. One final tip, in two parts! One excellent way of constructing good paragraphs is the following. Make the first sentence of your paragraph a statement of the general point which you are trying to make. Then make the other sentences in that paragraph set out the evidence or examples which support that general point. One way of testing this is to write out the first sentences (only) of all your paragraphs into a single paragraph. If you have followed the procedure correctly, this new paragraph should be an accurate summary of the content of your whole essay. The technique doesn’t work for all essays, of course; it is especially useful where a general argument supported by particular facts is what is asked for. The task of selecting and reporting the main features of the information in a table may look very complicated when you start. 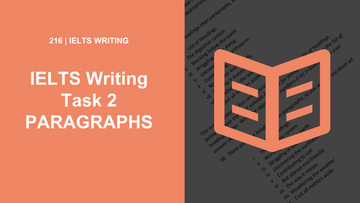 As we have seen, though, if we break the question down into its component parts, and allocate a certain number of sentences to each, we can acquire a natural and logical structure for our essays. Thanks for your kind words, Krishna! It keeps us motivated to work hard! After your essay correction, have you decided on the next step yet? Compliment thank you sir for this short material on a good paragraph . You’re most welcome, Kenneth! Let us know how we can help you further with your IELTS preparation.